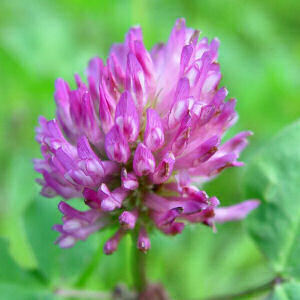 Currently, clover is one of the most prospective forage crops. It is grown for green fodder, hay, silage, haylage, and is used for making the grass meal, pellets and briquettes. In Russia, Albit is officially registered as a plant growth regulator of clover. Albit activates growth and development, accelerates regrowth after mowing, increases the number of inflorescences, accelerates the passing of phases of plant development, increases the plant resistance to unfavorable conditions of environment, provides the defense against plant diseases, increases the green mass yield, improves the product quality. On clover, Albit is also applied as antidote for decreasing the side phytotoxic effect of pesticides. Application recommendations. It is recommended 2 fold foliar spraying (40 mL/hа): first – at the beginning of vegetation (after overwintering), second – at the booting stage–beginning of budding stage (BBCH 10-40). To enhance regrowth after mowing, Albit may be applied for spraying during 7 days after mowing. It is more efficient to apply Albit in tank mix with leaf fertilizers. Adaptogenic effect of Albit is very important for clover and also for other perennial grasses. Albit increases the ability of plants to endure various stresses, such as overwintering, drought and mowing. Due to this fact, clover is one of the most Albit-sensitive crop. According to all conducted trials on clover, the average yield increase of green mass under Albit treatment was 36%. On clover, Albit has been tested since 2006 in field trials in Vladimir, Voronezh and other regions of Russia, and also in the Czech Republic and in other foreign countries. Field trials were conducted in Vladimir Plant Protection Station, All-Russia Institute of Plant Protection, Scientific Institute of Fodder Crops and also in other institutes and farms. In 2006, field trial was conducted in Vladimir region of Suzdal’ district. Clover var. VIK-7 was treated with Albit in dosage 50 mL/ha at the booting stage. Mowing was conducted one month after Albit treatment. Yield increase of green mass of clover was 7% (yield in control was 9.8 t/ha). Field trails were conducted on clover var. Trubetcheskij local of the second year of cultivation (All-Russian Research Institute of Plant Protection of the Ministry of Agriculture of the Russian Federation in Voronezh Region, 2008). Albit was applied twice during the vegetative season and also in the period of beginning of budding stage in doses 40, 70 and 100 mL/ha. Both treatments had a significant positive effect on the growth and development of plants. Due to increasing the height of stems and their weight by 10.7-27.4% and 40.7-57.3% over control, respectively, yield of green mass significantly increased. In all variants yield of clover green mass under Albit treatment increased by ~47% (by 57.3% and 37% in variant with Albit application after the first and the second mowings, respectively) (Fig. 1). In general, 2-fold treatment with Albit gave 14.4–18.3 tons of additional green mass per hectare (yield in control was 45 t/ha). Also, Albit influences on formation of clover generative organs. The maximal effect (the number of buds) was observed in variant with Albit in dose 40 mL/ha (174.8% to control). With increasing the application rate of Albit up to 70-100 mL/ha, yield of green mass was almost unchangeable. Thus, the optimal dosage of Albit is 40 mL/ha. This conclusion was made based on results with stimulating, protective and economic effects (All-Russian Research Institute of Plant Protection, Voronezh region, 2008). In the Czech Republic of 2012, field tests were carried out on meadow clover (Scientific Research Institute of Forage Crops, district of Brno). 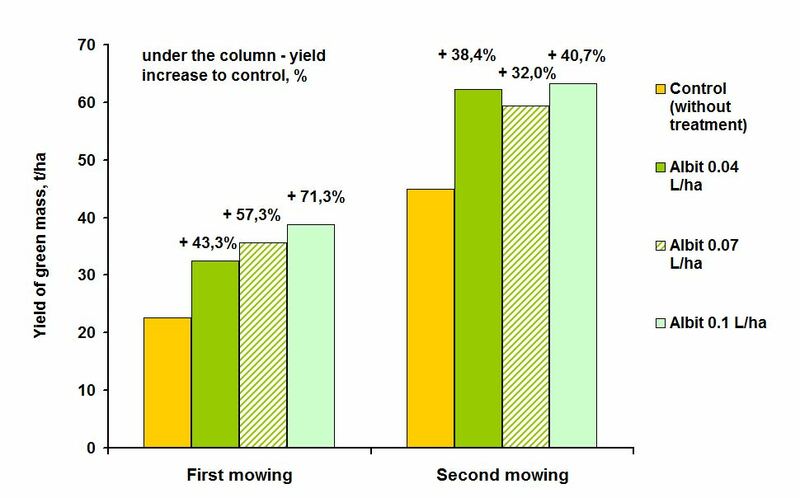 Taking in to account sum of all mowings, in the variant with Albit (pre-sowing seed treatment 60 mL/t and spraying of plants 7-10 days after the first mowing in dose 40 mL/ha), yield of green mass was 14.2% to control (9.37 t/ha in control, 10.7 t/ha in variant with Albit). Field trials on clover in Voronezh region shown the following: Albit has not only growth-stimulating, but also immunizing effect, protecting plants against a wide range of diseases (All-Russian Research Institute of Plant Protection, 2008). The maximal immunizing effect of Albit against the complex of pathogens was observed in variant with 2-fold Albit application, 40 mL/ha. In this dose Albit restrained the development of all studied diseases of clover: powdery mildew, ascohitosis, brown spot, and especially anthracnose and rust (biological efficiency was 92.2% and 72.7%, respectively). In the case of rust, fungicidal effect of Albit was clearly visible both at the beginning stage of disease development, and also in case of increasing infectious process during growing season. In this field trial, economic efficiency of Albit application on clover was evaluated. It was established that pure net income after Albit treatment was 21.678 rubles/ha, payback – 9.5 times.